Before submitting AMCAS and paying their fee, please ensure you meet our secondary requirements. These requirements are non-negotiable and your application will not be reviewed if you do not meet them nor will you receive a secondary application which is required for consideration. Ensure you can complete the premedical course requirements and earn a bachelor’s degree at an accredited college or university in the United States or Canada by July 15 of the year you will begin medical school. You do not need to complete all prerequisites before you apply, however you must complete all prerequisites by July 15 of the year you matriculate. Once you have determined you have met or will meet the secondary requirements at some point in the admissions cycle, apply through the American Medical College Application Service (AMCAS). AMCAS charges a $170 processing fee for one medical school designation and $39 for each additional medical school designation. Find out about the Fee Assistance Program. Our AMCAS application deadline is October 15. The AMCAS deadline is October 15 at 11:59 p.m. Eastern Standard Time. Once we receive your AMCAS application, our system will check to see if you have met the secondary requirements. This may involve requesting official documentation from you to prove you meet a definition of resident student. If you are applying for admission as a U.S. permanent resident, submit a copy of your permanent resident card to the Office of Admissions and Recruitment. Check that your letters of recommendation have been sent. Your letter writers submit all letters of evaluation through the AMCAS Letters of Evaluation/Recommendation Service. Receiving these is one of the requirements to receive a secondary application. When you submit your secondary application, you will be asked to pay a $50 fee using a credit card. Once proof of payment is received, the AMCAS application, letters of evaluation and the secondary application will be assigned to two screeners who review the full file to make independent recommendations for interview. Your application will remain in review until we have filled all interview seats. Those who are not invited for an interview are notified they are no longer being considered upon the end of the interview season. When reviewing completed applications, the Committee looks for relevant life experiences and personal attributes, and connections to the state of Washington. The secondary application is your opportunity to showcase every aspect of your ability, experience and character that aligns with the College’s mission and vision: to discover solutions for challenging health care environments in Washington. Holistic review is a balanced consideration of experiences, attributes and metrics that help us meet our mission. Since we have established GPA/MCAT threshold combinations as a partial requirement to receive a secondary application, once the secondary application is submitted, we blind the MCAT and GPA from further consideration. After you submit your secondary application, you can log into a portal to check your application status. A final admission decision will be sent to the email address you provide during the application process. Please ensure the email you included on AMCAS and the secondary are the same. The College will email interview invitations as early as the beginning of July. All communications are sent via email so please include a valid and regularly monitored email address on your AMCAS and secondary application. You cannot schedule an individual appointment with the admissions office to discuss your qualifications once an application has been submitted and you are under consideration. You may ask general questions during this phase. Interviews will take place from August through February. The National Association of Advisors for the Health Professions (NAAHP) has published a guide called “Interviewing for Health Professions Schools” that is available for purchase online. If you are selected to interview, you will participate in our hybrid MMI process, which is a series of eight one-on-one interviews. In seven out of eight sessions, you are assessed on your response to a structured scenario. The eighth session is a one-on-one structured interview with an Admissions Committee member. These interviews are not intended to assess your specific knowledge in the field. Instead, they focus on the personal attributes that align with the College’s mission. Responses are flexible, and there are no right or wrong answers. Your interviewer will use a Likert scale to evaluate your thought process and ability to think on your feet, as well as describe their observations. You will have one minute to transfer between stations. Before each of the seven mini-interviews begin, you will be given a question or scenario and have two minutes to consider your answer. Upon hearing a signal, you will enter the interview room. You will respond to the question in a short conversation with an interviewer. After five minutes, a signal will sound again. 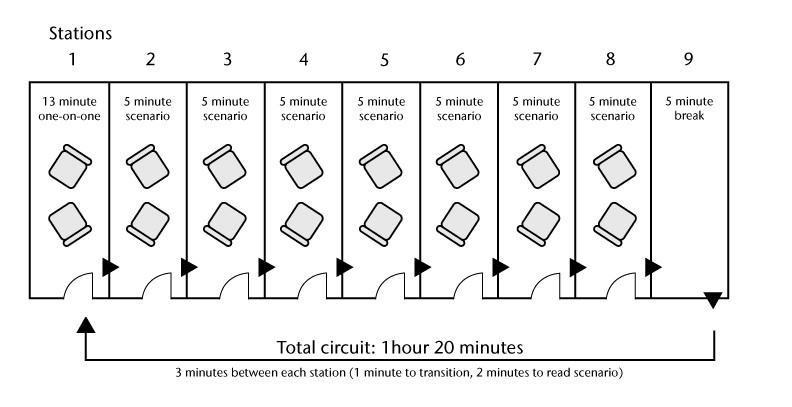 You will have one minute to rotate to the next interview room—and the next question/scenario—in the circuit. At the one-on-one interview station, you will have a question-and-answer-style interview with an Admissions Committee member, but you will not be exposed to the questions prior to entering the room like other mini-interviews. The College uses a rolling admissions process. The Admissions Committee meets at several intervals from September through March to review applicants and make admission decisions. If you have been accepted to the Elson S. Floyd College of Medicine and decide not to attend, it would be courteous and professional to decline your offer or withdraw your acceptance by emailing medicine.admissions@wsu.edu. This allows the College to admit another applicant in a timely manner. It is prudent to review the AAMC Application and Acceptance Protocols for Applicants, especially as it pertains to holding multiple offers of acceptance. In particular, if you receive an offer of acceptance from more than one medical school on or before April 30th, select only one program and withdraw your acceptance from all other schools from April 30 and after. If you are on the Waitlist and do not plan on attending the College after all, please withdraw your application by emailing the Admissions Office. This allows for the Waitlist to include only those who are still interested in attending the Elson S. Floyd College of Medicine. After you are admitted, there is a $100 pre-enrollment deposit required, payable through the myWSU portal (instructions will be provided after admittance). Your deposit is refundable until April 30. If you enroll in the Elson S. Floyd College of Medicine, your deposit will be deducted from your tuition. Two reviewers will independently examine each interviewee’s application holistically and present these to the Admissions Committee. They are interested in our identified life experiences and personal attributes. The Admissions Committee decides which applicants will be granted admission. This decision is final and free from any outside influence. The Elson S. Floyd College of Medicine does not offer an early decision program. Some applicants may be invited to take a place on the Waitlist for admission. Offers from the Waitlist occur once all seats have been filled and a previously accepted applicant then chooses to withdraw. Offers from the Waitlist can be made until orientation in mid-August.